I have installed python27 and py27-game via MacPorts. This seems to be the best route for success with MacOSX Yosemite 10.10.3, and yet I'm still not quite there. Is there a better install I should make? I tried homebrew and then it works but has only one font available, a very crunched-up square-ish all-capitals rounded font which I forget the name of. I suspect there is simply something preventing the Python/PyGame/Freetype subsystem(s) from successfully enumerating my fonts, since every other app on the system can find fonts just fine. I saw that after running python config.py, this was the output, which looks like some freetype stuff was not binding properly. I do have XQuartz on my system too, if that makes a difference. Which version of XQuartz have you installed? Also, after installing XQuartz, a full system reboot is necessary. Have you rebooted the system since installing XQuartz? Is your issue different from Issue #177? 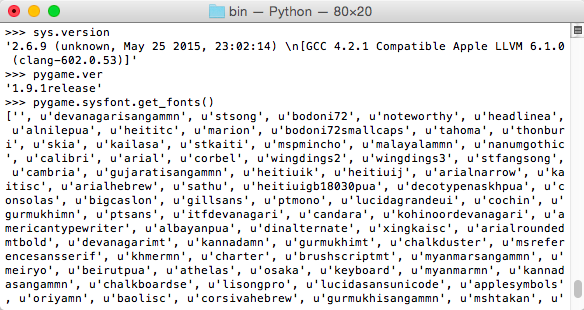 Using OS X Yosemite 10.10.3, XQuartz 2.7.7, MacPorts Python 2.6, and MacPorts py26-game (1.9.1), sysfont finds many fonts. Yeah, I've got other forms of discontent going here. On one MacOS yosemite system, Quartz 2.7.7, I find all kinds of fonts. On another, zero. I redid my build from tip and now the problem has changed to finding two SDL libraries at runtime, and it being "undefined" which one will bind. If I remove either one of the two SDLs that it says it finds, it says "Can't find X, cannot run." This underscores the basic problem that I don't know how MacOS searches for runtime shared libraries. I'm going to have to nuke all my libs and start afresh here from clean, now that I know it runs on another macos system with slightly-different libs installed. Thanks for your info and ideas. I'll post more when I get things cleared out and rebuilt, if ti doesn't start working magically.